Do you know where your money goes? Mint.com is a free website with robust budgeting capabilities, owned by Quicken. Mint.com automatically pulls all of your account transactions together and categorizes them with your preferences. It’s easy to use, and a pie graph automatically shows you how your money is spent. You can set limits on your spending with reminders sent to your phone, and you can check your spending easily with mint’s app. With so many capabilities to help you better manage your money, what are you waiting for? Consider how much your children use the phone, or if they might need one in the event of an emergency, if they do not have their own cell phones. After evaluating, you might just decide to eliminate your home phone, simplify your life, and save money! Lock in your natural gas rate with a 6 or 12 month fixed rate. When you don’t, you subject yourself to the variable rate, which is often double the rate you could be receiving. If you are in a de-regulated market, such as Georgia, you have multiple gas marketers to choose from, with varying rates and programs. These should be listed on a government-sponsored site from the local Public Service Commission. For rates in Georgia, check here. If you are under contract with a marketer, you may have a penalty to switch, and you would need to evaluate your options. In states that are not de-regulated, you should go to the utility’s website to see rate options and decide if you are better off with a fixed or variable rate plan. Interest rates are still low and it is still a good time to refinance your mortgage, if you haven’t already. You might even consider paying extra on your mortgage instead, and shed years off of your mortgage term by paying down the principal balance earlier on. I have a love for flowers and gardening, so this is important for me but you may care less! 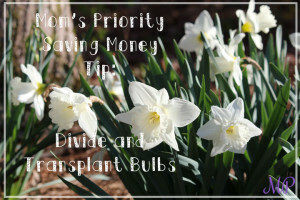 Divide and transplant your own plants and bulbs after they bloom. 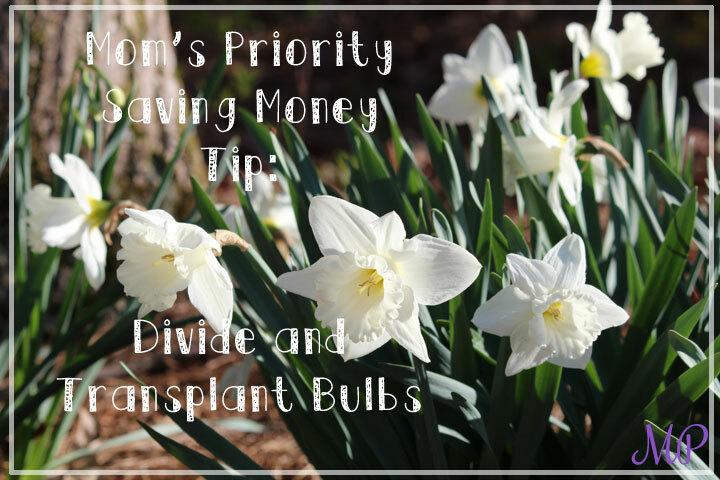 Your bulbs need to be divided to continue to produce flowers every several years. Bulbs that thrive from this include lilies, daffodils, and crocuses. The result will be many more flowers and a beautiful garden! For more info, see http://www.bhg.com/gardening/flowers/annuals/dividing-hardy-bulbs/. 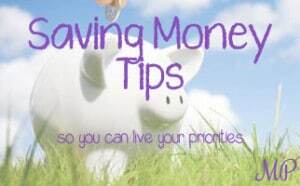 Mom’s Priority Saving Money Tip: Buy Kids Clothes Now! Shop ahead for the next year, and put away clothes until then. Right now is a great time to get kids’ previous season clothes greatly marked down. Buy a size up, and put them away. You will see the same clothes next fall in the stores at full prices. Macys.com is a great place to find kids’ clothes on sale and clearance. Sometimes there are exclusions to Macy’s additional coupons and promo codes, but hopefully you can click below and get some great deals using promo code “deals.” Free shipping with $99 purchase, and free returns to any store make this an easy way to stock up for next year. Mom’s Priority Saving Money (and time) Tip: Say “DONE!” to that dreaded shopping trip! Shop at Walmart.com, and get the same items that you’d buy in the store, delivered to your door! Same low prices, and delivery is free when you spend over $35. Save your list at walmart.com and reorder easily. Shop the Winter Savings Event at Walmart.com! Do you have kids in tow, have trouble getting around, or just dread the trip to the store in rain, snow, sleet…? I have dreamed of the day when I could shop online, get fair prices, and not have to buy in bulk, and walmart.com is one supplier that is helping fulfill that need! The best aspect is being able to save your shopping list, so you don’t have to look through all of the products to find yours every time you reorder. You can prevent impulse purchases in the store by sticking to your list online, and check one thing off your To Do list easily!